This section deals with surgery of the lungs and heart. For a discussion of cosmetic surgery of the chest area, as of the breast, see “Plastic and Cosmetic Surgery” later in this chapter. Before the era of modern drugs such as antibiotics, lung disorders were the leading cause of death in the United States. Lung diseases are still common enough. With every breath taken in, the lungs are vulnerable to damage from disease organisms, chemicals, and air pollutants, many of which did not exist 50 years ago when pneumonia and tuberculosis were among the greatest threats to human life. Because the lungs are not as sensitive to pain as some other organs, a respiratory disorder may develop insidiously with few or no symptoms. When pain is felt in the chest area, the source of the pain may be the chest wall, the esophagus, or the bronchial tubes that branch from the trachea into smaller units that distribute air through the lung tissues. Other symptoms of respiratory disease may be coughing, shortness of breath, or sputum that contains blood. Any of the above signs or symptoms could be associated with tuberculosis, which also can cause loss of appetite, weight loss, lethargy, and heavy perspiration, especially during the night. Tuberculosis is still one of the most common causes of death in the world, and new cases are found in the United States each year at a rate of 18 per 100,000 population. In addition, an estimated 35 million Americans are tuberculin-positive, indicating they have been in contact with the infectious organism but have developed an immune response to it. For an explanation of how tuberculosis is spread and of tests devised to check its spread, see “Tuberculosis” in Ch. 12, Diseases of the Respiratory System . A dozen different drugs are available for medical treatment of tuberculosis and several types may be taken in combination by a patient. Intensive treatment may require a hospital stay of several months and use of the drugs for at least 18 months. However, because of the adverse side effects of drugs, resistance of the bacterium to the drugs, and other reasons, surgery may be required. If one of the five lobes of lung tissue—the right lung has three lobes, the left lung two—has been severely damaged by tuberculosis, it may be removed by surgeons. In some instances, physicians may recommend that surgery be undertaken to allow one of the lungs to rest while it recovers from the infection. This is accomplished by crushing the phrenic nerve, under a local anesthetic, creating a partial paralysis of the diaphragm. Partial lung collapse also can be accomplished by removing parts of the ribs over the affected lung. Cancer of the lung may appear with early symptoms of coughing, wheezing, or the appearance of blood in sputum; in about 10 percent of cases there is chest pain or shortness of breath. However, it is not unusual for the lung cancer patient to have no complaints of illness. Chest X rays during a routine physical examination may reveal the disease. In many cases, the cancer develops from metastases of cancers that have spread from other body systems. Medical therapy for lung cancer patients, including the use of radiation, is primarily for the purpose of relieving pain or other symptoms. The only effective cure is surgical excision of the affected lung tissue along with the nearby lymph nodes. Surgical treatment is most effective in young adults when the tumor has not invaded neighboring tissues, although the five-year survival rate for lung cancer is still poor. Heart surgery procedures that are routine in many hospitals today were unheard of a generation ago. Since World War II, techniques have been devised to permit attachment of a heart-lung machine to the human body so that the patient's blood can be circulated and refreshed with oxygen while the heart itself is stopped temporarily for surgery. While the blood flow is shunted away from the heart, surgeons can replace a diseased heart valve that may have become calcified with deposits that keep it from closing normally. An artificial valve made of metal and plastic may be used to replace the patient's diseased mitral valve that no longer effectively controls the flow of blood from the left atrium to the left ventricle of the heart. Artificial valves also can be installed between the right chambers of the heart. In some cases, a diseased valve leaf may be repaired with a graft of tissue from the patient's body. Installation of artificial heart valves has had a remarkably good record of success; some surgeons recommend the procedure over other techniques for treatment of heart valve diseases and report the operation has been well tolerated by patients over 70. While some activites may be restricted, life expectancy is increased for most patients, and they are able to have comfortable and more normal lives after such operations. 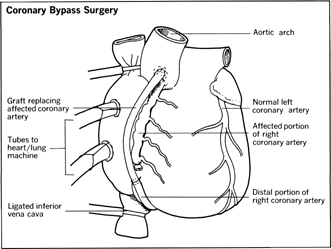 Another kind of heart surgery is used to correct a septal defect. 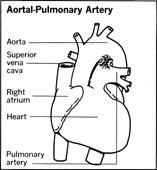 The right and left atria of the heart are separated by a septum, a wall of muscular tissue. A similar but much thicker septum separates the left and right ventricles. Occasionally, usually because of a birth defect, the septum does not close completely and blood flows from one side to the other through the opening in the heart wall. The problem is solved by putting the patient on a heart-lung machine while the heart is opened and the septum closed either by sewing the opening or by stitching into the septum a patch of plastic material. An equally dramatic bit of heart surgery is used to correct a defect called coarctation , or narrowing, of the aorta, the main artery leading from the heart. This short, pinched section interferes with normal blood flow. If untreated, the patient may die of a ruptured aorta or heart failure. Treatment requires an operation in which the narrowed section of the aorta is cut away and the two normal-sized ends sewed together. In some cases, a piece of plastic material is sewed into the reconstructed aorta to replace the coarctated section. A comparatively simple bit of heart surgery is employed to correct a defect that occurs in some newborn children. Before birth, when the lungs are not needed because fresh blood is supplied from the placenta via the umbilical cord, the aorta is connected by a shunt to the pulmonary artery. After birth the shunt closes in most cases so the pulmonary artery can carry the blood from the heart to the lungs for oxygenation. In some children this shunt fails to close. To correct the defect and prevent heart failure, the surgeon opens the child's chest, ties off the open shunt, and cuts the ligated connection.